One of these days, Masher will learn how to use that dang self-timer. Masher McBuns was bitten hard by the tri bug after his triathlon in July. All the hard work and dedication he put into training in swimming, biking and running was a lot of fun, even though swimming doesn't come naturally to labbits (most labbits, anyway!). He was bummed out by the flat tire he got at Give Peace A Tri, but he still finished the race with a big smile on his face. Sunrise over Wallis Sands State Park. Photo courtesy of S. Delude. 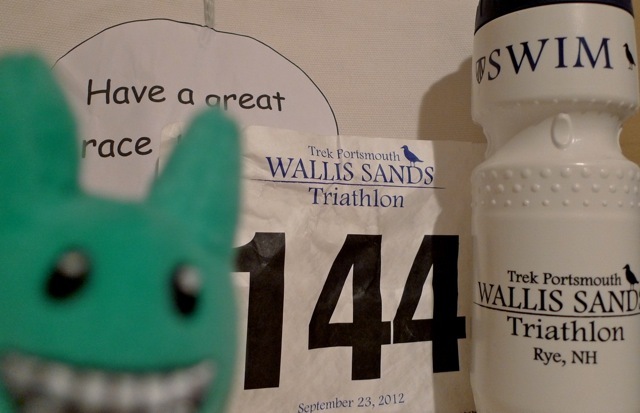 Looking for his next challenge, he signed up for the Trek Portsmouth Wallis Sands Sprint Triathlon in Rye, NH. 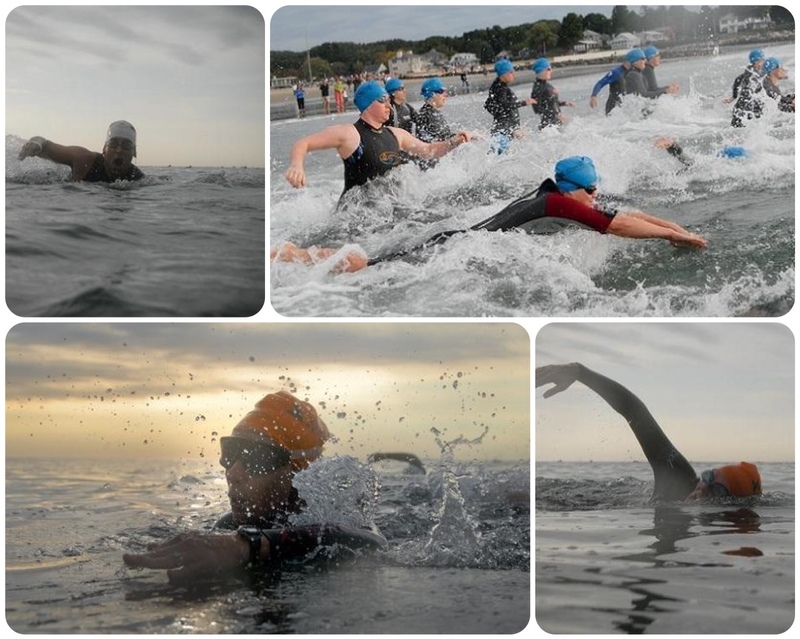 A sprint distance race with 1/3 mile ocean swim, 15 mile bike and 3 mile run, this race would be longer than Give Peace A Tri, and Masher looked forward to more training and an ocean swim - his first time in the ocean! More than anything, he hope to complete the bike leg without any flats. The bike leg is his favorite of the three sports, and he was ready to rock the 15 mile ride. The day before the race, Masher picked up his race packet at the Trek store in Portsmouth. Early packet pickup let him get his race number on his bike, helmet and race belt, plus he got to drool over the swag bag contents: a Wallis Sands Tri sticker, a nice water bottle, and a tech t-shirt which is nice but he'll probably never wear it because his fur is enough to keep him warm, and he hates overheating while training. Transition restricted to athletes and race crew only. The morning of the race, Masher hydrated and downed a bit of cinnamon raisin bagel with Nutella and half a banana. He arrived early to get set up in transition. This transition area was aces above the Give Peace A Tri race. The area was fenced off and for "athletes only". The racks were numbered 1 - 6 with bib numbers assigned to the racks. What a civilized system! 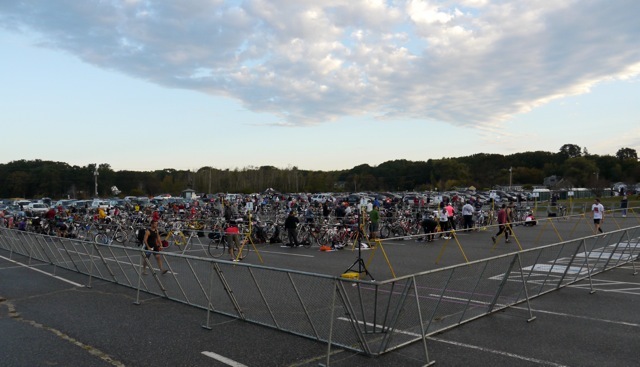 No need to scramble to the race early and ensure your spot, no need to wrestle other people's things aside because they take up more space than they should, and no need to yell at stragglers in the transition area when they're standing around on their phones and in the way of a full speed triathlete trying to run the bike out onto the course. No fake racers sneaking in to steal a bike more expensive than your car! Masher made his way in the transition area to find his number - 144 - on the second rack, when he came across another labbit! He had gotten there super early early in the morning (before the dawn of time, in Masher's opinion), had been first to set up in transition, had already gone into the ocean for a warm up swim, and was just hanging out under a plastic wrap to keep his muscles warmed up while he watched people set up. 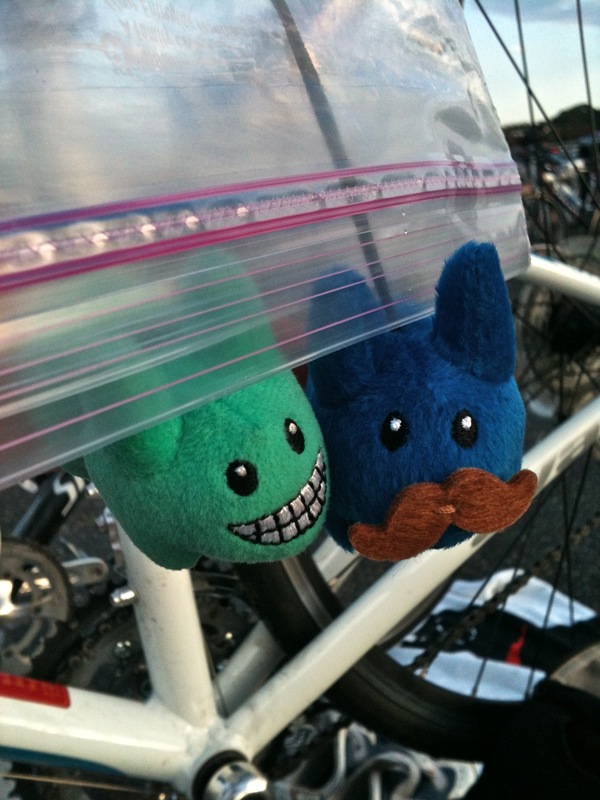 He knew that Masher was the only other labbit signed up for the tri so he figured he'd hang out at Masher's spot on the rack to surprise him. Doddy doesn't dawdle. He's first to set up in transition. Photo courtesy of T. Ruel. 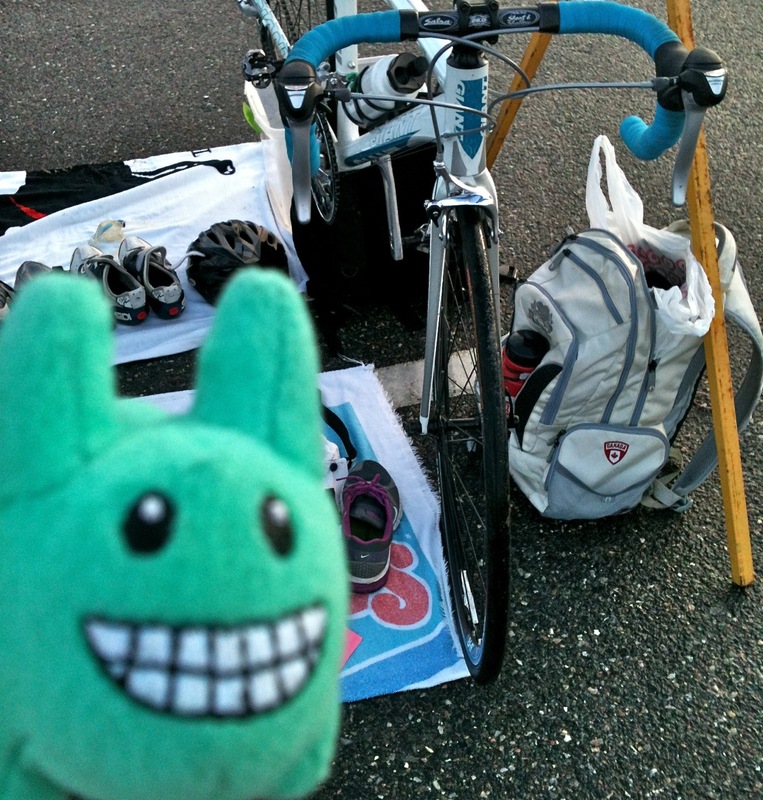 Masher was so happy to see another labbit signed up for the race! 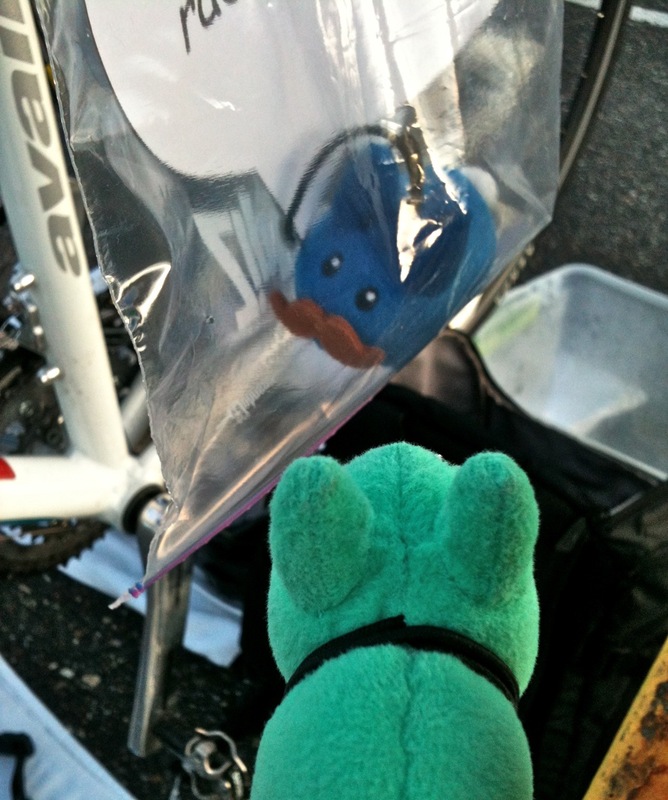 The buff labbit with handsome facial fur and bib #16 introduced himself as Doddy Blue. He owes his deep blue coloring to having spent a lot of time in the cold Atlantic waters in Maine. Unlike most labbits, Doddy grew up by the ocean and took to water quite naturally. With not too much time left before the pre-race briefing and start, Masher finished setting up and hopped out to the ocean for a warm up swim. 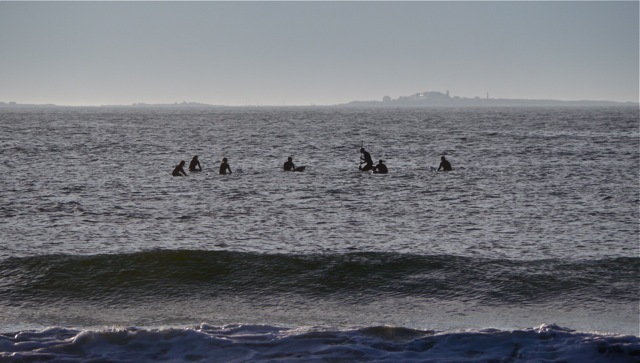 It was then that he realized the ocean swim would be quite different from his Give Peace A Tri experience. 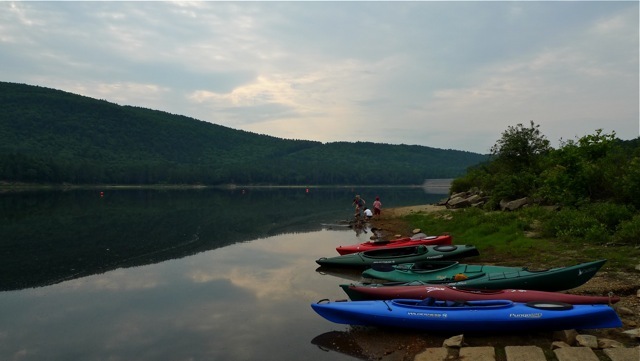 Ah, glassy, mirror like lake waters. Give Peace A Tri 2012. 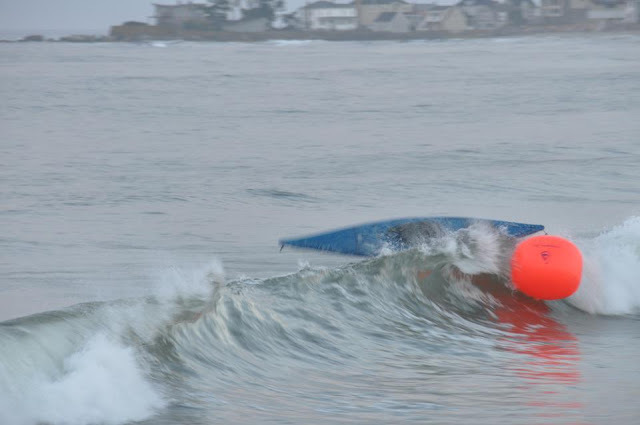 Race crew had a difficult time setting up buoys. This was attempt #1. Photo courtesy of T. Ruel. This was attempt #2, which did not go so well. Photo courtesy of T. Ruel. The lifeguards on surfboards managed to set the buoys up on attempt #3. It looked calm. If he had known the ocean could throw up waves like this he wouldn't have signed up. How naive! He even lives with Clover, you think he'd have asked her what the ocean was like. She'd been to Punta Cana earlier that year, and even posted about it on the blog. Masher must have been too busy to read the blog himself. He came out of the water, shook himself off and joined Doddy under the plastic wrap to keep warm before the start. Then he talked Doddy's ears off to try and calm his nerves, and Doddy was nice enough to listen. Or, wait - maybe only with one ear? Half listening? With warmed up muscles and some pre-race chat, they were ready to start. Check back on the blog for Race Report Part Two!